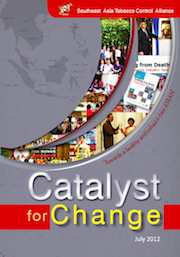 SEATCA‘s programs have contributed to the advancement of the tobacco control movement in Southeast Asia, through its country partners: Cambodia, Indonesia, Lao PDR, Malaysia, The Philippines, Thailand and Vietnam. Promotion and implementation of the WHO Framework Convention on Tobacco Control (FCTC) is also a priority. SEATCA uses regional workshops to mobilize local partner NGOs to create a region-wide focus on WHO-FCTC issues, and generate international awareness. With SEATCA’s experience and regional capacity, a ripple is created, and continues on to build significant momentum to the regional tobacco control movement-and vice versa.